It’s that time of year. The grass has started to green, neighborhoods have emerged from hibernation and the area’s evolving trail system is ready for use. As residents dust off their bikes, strollers and tennis shoes, let’s walk through the winding trails of Waukee and beyond. Waukee has three main trails—Heart of the Warrior, Sugar Creek and Raccoon River Valley Trail (RRVT). The Heart of the Warrior Trail is three miles long and runs east to west through many of Waukee’s residential neighborhoods. Parking is available on the east side of the trail at Lion’s Park. Heart of the Warrior connects to Clive’s Greenbelt Trail, which leads to an extensive trail system. Centennial Park also sits along the trail, just across Ashworth Road, and provides a nice place for picnicking and playing outdoor games. The Sugar Creek trailhead is at the intersection of Warrior Lane and University Avenue and curves through the city’s southern neighborhood of Glynn Village. This trail also runs through Centennial Park by way of a pedestrian bridge connected to the Spyglass neighborhood. Scenic views of the Sugar Creek Golf Course are an added treat. description of attractions and amenities in each community. 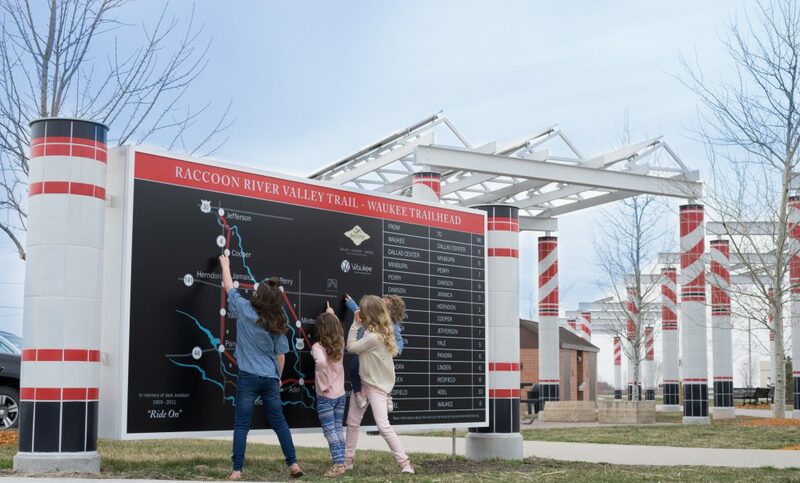 In March, Waukee unveiled a new $1.1 million-dollar public art installation on the RRVT gateway trailhead. “Waukee Railroad Pergola: In the Shadow of the Rails” was designed by nationally recognized artist David Dahlquist and RDG Planning and Design of Des Moines. Dahlquist is also the mastermind of the High Trestle Trail bridge lighted superstructure that runs across the Des Moines River between Madrid and Woodward. Similar to the High Trestle Trail bridge, the Waukee Railroad Pergola will be illuminated from dusk until dawn. At least six additional locations along the RRVT loop will adopt aspects of the main trailhead structure, making it the longest linear public art installation in the country. Grand Prairie Parkway also consists of two pedestrian underpasses. Waukee Parks and Recreation Director Matt Jermier said the underpasses were necessary for safety reasons. “We were getting a lot of comments about how busy that road is, and how dangerous it is to get across. As you’re trying to develop your trail system, the last thing you want is residents interacting with a six-lane road,” he said. Safer routes also mean creating more underpasses. “The crossings on Hickman are just way too crazy,” said Walsh. He has been involved with numerous fundraising efforts for the trail system and says a connector from RRVT to the High Trestle Trail is another project on the list once more funds become available. Jermier said there has been an uptick in charity events and 5k runs since completing the north loop on RRVT. “We get usage numbers from Dallas Country Conservation, and those continue to increase year after year,” said Jermier. One of Waukee’s largest and best-known trail events will take place on Saturday, June 16. The annual BACooN ride covers 71 miles of on the Racoon River Valley Trail and will be presented by the Blue-Ribbon Bacon Festival, RAGBRAI and the Iowa Bicycle Coalition. Numerous stops along the way will provide tasty bacon treats. music on Fridays and Saturdays from 7-10 p.m. at Perry’s historic Hotel Pattee. 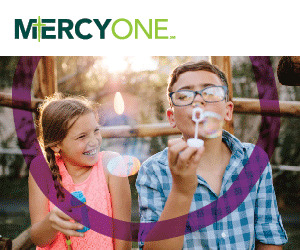 If you’re looking for a pit stop where you can grab a drink and pump some more air in your tires, consider the following Waukee establishments: Mickey’s Irish Pub, Saints Pub and Patio, and Hy-Vee Market Grille (where the tire pump is located at Hy-Vee Gas). Additional places with food and/or drink near the Waukee trails include 1908 Draught House, Rookie’s Sports Bar and Grill, Kenny’s Garage, Sidetrack Pub, and Broheim’s Indoor Golf and Pub. For more information on Waukee’s trails, visit waukee.org.